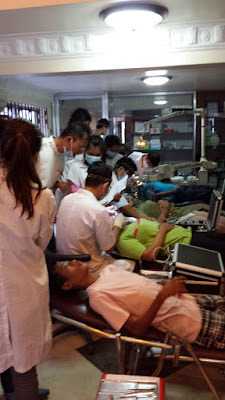 At Grace House Dental Clinic in Cambodia. Five Rotarians from the Rotary Club of Balclutha, NZ flew to Cambodia to work in the slums of Phnom Penh in September 2014. They worked with the One-2-One Charitable Trust www.one2oneworld.org that provides medical, dental care and schooling to the vulnerable and destitute families in slum areas. Money for the club’s first international aid mission was raised via a $2000 District Grant from 9980, their Rotary Club of Balclutha’s $10,000 donation, other local donations and the group’s personal givings. The humanitarian travellers included dental surgeon David Tait, paramedic Stuart Holgate, intensive care nurse Ngaire Pannett, plus Peter Buxton and Joan Hasler teaching English in the save our students (SOS) drop-in centre schools. The group lived with sponsored students in Grace House which is owned by the One-2-One Charitable Trust. 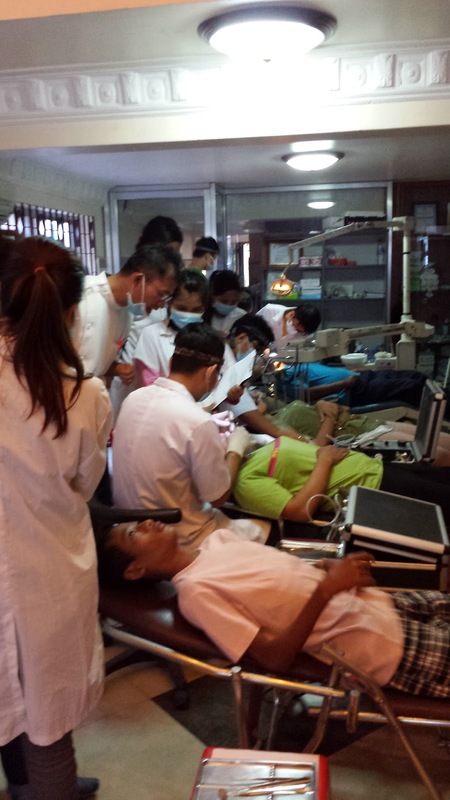 The dental clinic is part of Grace House, so this is where David worked alongside dental students. Orphanages and schools from around the city would bring the child patients, including those with HIV, for dental work. Each day Stuart and Ngaire would venture into the slums with Cambodian nurse and interpreter Linda Bahn who originated from a slum and had then been sponsored through schooling and nursing school. She knew all of the people living in the slums, including those needing medical attention, water or food. Each day they visited the slums where they gave out shoes and clothing they had brought at the markets. The story that stole their hearts was a little boy called Diamond. He had HIV, as did his mother who was being treated. His little brother is thankfully free of the disease. His father was in jail. Diamond had been put into the HIV Clinic but he had run home. That little boy clung onto Stuart not wanting him to leave and his mother hugged Ngaire in desperation for her little boy. Finally the family were taken into the clinic where Diamond is now doing fine and going to school. Peter and Joan spent time teaching English and interacting at the SOS schools. There is a sponsored teacher who encourages the children to come to their little schools to get into the learning habit, so they can go to the public schools. Books and other school needs were given out. A day was spent out in the country with the One-2-One medical team. They were based in a sponsored Australian compound where they work with the country people, teaching them to stay and work the land, to stop them going to the cities for work, not getting it and ending up living in the slums. The medical team checked the people who came from far and wide for medical help. What surprised the group was the cleanliness of the people and their tiny shacks in amongst all the rubbish, filth and plastic bags that lay around. Some earned a little money for food and water from recycling cans, plastic bottles and cardboard. These people have nothing, but always give a smile and love a hug, and they are grateful for anything they receive. The group of Rotarians from Balclutha will cherish their Cambodian adventure forever. They could change very little, but every little bit helps, and it shows that we do care about these impoverished people. The last three days the group bussed to Siem Reap to visit Ankor Wat. They flew home a very different group of five Rotarians who experienced “one smile at a time and one life at a time” does make a difference.